Pollutants from more than five million civil and nearly 2,800 military flights each year are destroying Earth’s protective ozone layer and stealing blue skies, while accounting for more than 10% of global greenhouse warming. But wait. Isn’t wild weather happening everywhere? And isn’t jet travel responsible for significant global warming? 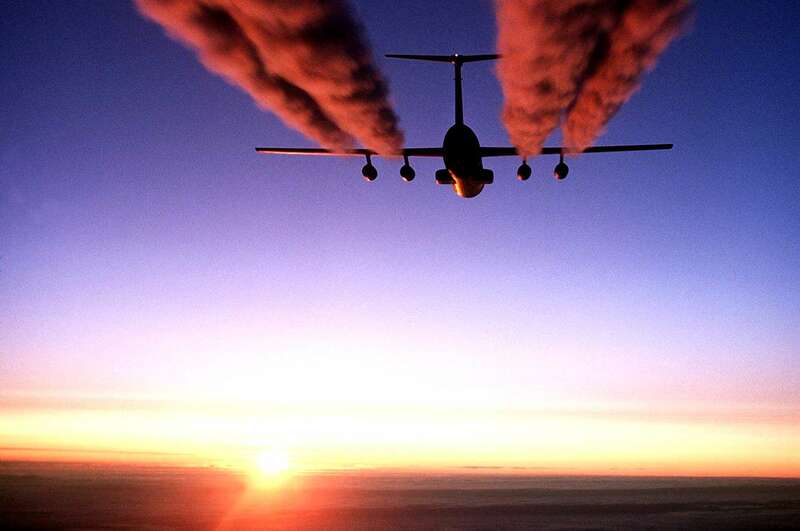 Aren’t sky-high aircraft emissions destroying the ozone layer? What about the effects of radiation exposure and lack of oxygen on humans as captive as astronauts on long-haul flights? Is zooming through thin air more than two miles above the Earth worth the risk to planet and passengers? Or should we be booking with passenger-accommodating freighters, taking the train, or staying home instead? More than 4% of all CO2 emissions are emitted by high-flying aircraft. We all play a role in stopping global warming. Do it for the planet and ourselves. nice site...lovely backgroud 'interesting' (haha) topic and great taste in music! lol. check my site out too iight? A couple of things that might be of interest. When you take the planes out of the sky, there is an immediate and dramatic change in temperature, as what happen after 9-11 (Travis, 2002). The temperature basically changes back to pre-1950's records, before the jet age. Aircraft routes over-the-top do extrodinary damage to our climate (Ruthenberg, 2007, Global Winds). Finally, there are plans to massively increase the number of flights by 4 artificial growth modes. Triplying flights by 2015 (not passengers), and doubling flights every 8-10 thereafter, until 2050, if left unchecked. This very well could be disastrous. in a very short period of time. Outstanding article. Always good to have a well-researched piece on this issue. the aircraft are one of the principal causes of air pollution, but if we don't do something to reduce it, probably in future will be too late. tarnish, and for those with sensitive skin, it is also hypoallergenic, making it comfortable to wear.